Football grounds in England fell silent in tribute to the 25th anniversary of the Hillsborough disaster. Matches in leagues across England kicked off seven minutes late to remember the 96 fans who died on 15 April 1989. This weekend's matches, including both FA Cup semi-finals at Wembley, will all hold a minute's silence. The delayed starts apply to the top eight divisions in England, the FA Cup and the Welsh Premier League. Scarves from every club in the top four divisions created a number 96 at Anfield as a "sign of unity" while fans also held up a mosaic tribute. An inquest into the disaster, which began at the start of the 1989 FA Cup semi-final between Liverpool and Nottingham Forest, was re-opened in Warrington on 31 March. That match ended at 15:06 BST and resulted in the many fatalities, while hundreds more were injured. 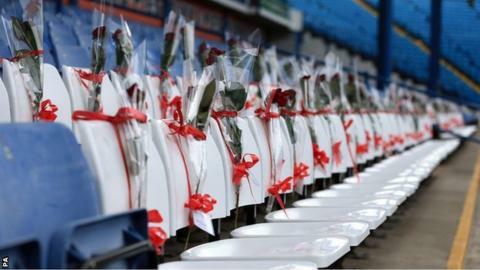 For their Championship match against Blackburn, Wednesday replaced 96 blue seats with white seats bearing red roses at the end of the stadium where the fans died. Liverpool face Manchester City at Anfield on Sunday, when another silence will be held. A service involving victims' relatives, club officials, players and staff will also be held at Anfield on the anniversary.